VietPress USA (Jan. 1st, 2018): AOL reported that "The first family rang in the new year in the most fashionable way! President Trump, along with Melania and Barron, celebrated New Year's Eve at a gala held at President Trump's Mar-a-Logo resort. 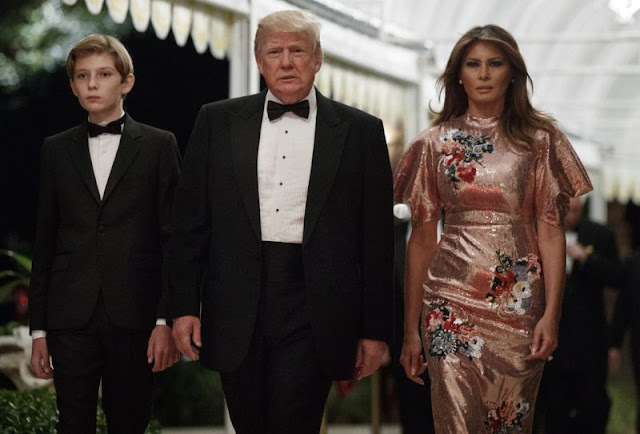 Both POTUS and 11-year-old Barron looked polished in matching tuxedos, but of course, it was Melania who stole the show. The 47-year-old first lady dazzled in an intricately beaded gown by London-based luxury designer ERDEM. The floral-inspired sequin frock, which retails at nearly $5,500, featured an A-line cut and bold batwing sleeves. She complemented the tight, blush frock with pink pastel stilettos and her trusty blowout"
But Trump starts New Year 2018 by twitting to criticize Pakistan that "The United States has foolishly given Pakistan more than 33 billion dollars in aid over the last 15 years, and they have given us nothing but lies & deceit, thinking of our leaders as fools. They give safe haven to the terrorists we hunt in Afghanistan, with little help. No more!" Trump then attacked Iran as "Iran is failing at every level despite the terrible deal made with them by the Obama Administration. The great Iranian people have been repressed for many years. They are hungry for food & for freedom. Along with human rights, the wealth of Iran is being looted. TIME FOR CHANGE!" President Donald Trump is kicking off the new year at one of his Florida golf clubs, where he is hosting two professional golfers. The White House said Monday that Trump was with Fred Funk and his son Taylor Funk. Trump has been spending the holidays at his Palm Beach private club, heading to his nearby golf club most days. Last week he invited Coast Guard members to golf and have lunch. Trump will return to Washington later Monday. President Donald Trump says Iran is "failing at every level," and he is voicing his support for the protesters there, saying it is "TIME FOR CHANGE." Trump says on Twitter Monday: "Iran is failing at every level despite the terrible deal made with them by the Obama Administration. The great Iranian people have been repressed for many years. They are hungry for food & for freedom. Along with human rights, the wealth of Iran is being looted. TIME FOR CHANGE!" The protests began Thursday in Mashhad over economic issues and have since expanded to several cities. Hundreds of people have been arrested. While some have shared Trump's tweets, many in Iran distrust him as he's refused to re-certify the nuclear deal and because his travel bans have blocked Iranians from getting U.S. visas. President Donald Trump began the New Year by sending an angry, early morning tweet criticizing Pakistan. Trump tweeted: "The United States has foolishly given Pakistan more than 33 billion dollars in aid over the last 15 years, and they have given us nothing but lies & deceit, thinking of our leaders as fools. They give safe haven to the terrorists we hunt in Afghanistan, with little help. No more!" It was not immediately clear why Trump opted to tweet on Pakistan. The U.S. has long accused Islamabad of allowing militants to operate relatively freely in Pakistan's border regions to carry out operations in neighboring Afghanistan. Bidding farewell to 2017 with a lavish party at his private club, President Donald Trump predicted 2018 will be a "tremendous year." Trump said Sunday that the stock market will continue to rise and that companies are going to continue to come into the U.S., at "a rapid clip." He also cited several accomplishments, including the tax overhaul, opening the Arctic National Wildlife Refuge to oil drilling, and repealing the individual mandate from the national health care law. 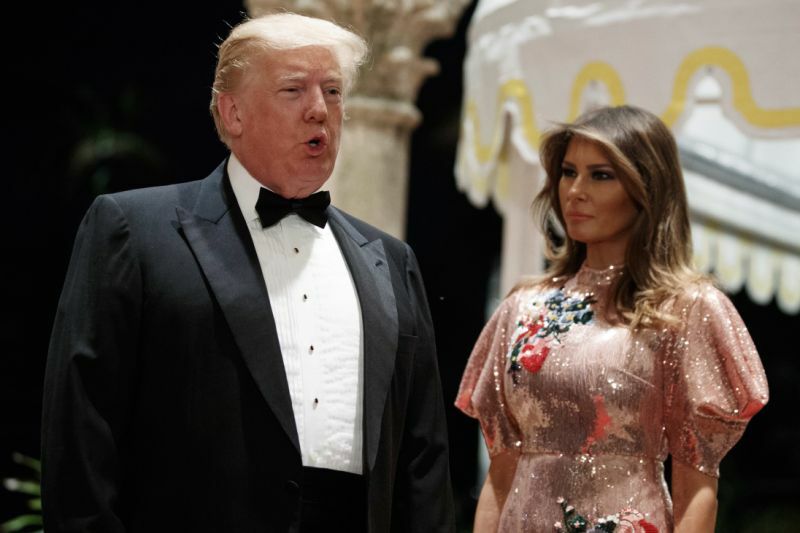 "It will be a fantastic 2018," a tuxedoed Trump said, as he entered the gilded ballroom at Mar-a-Lago, accompanied by first lady Melania Trump and son Barron.